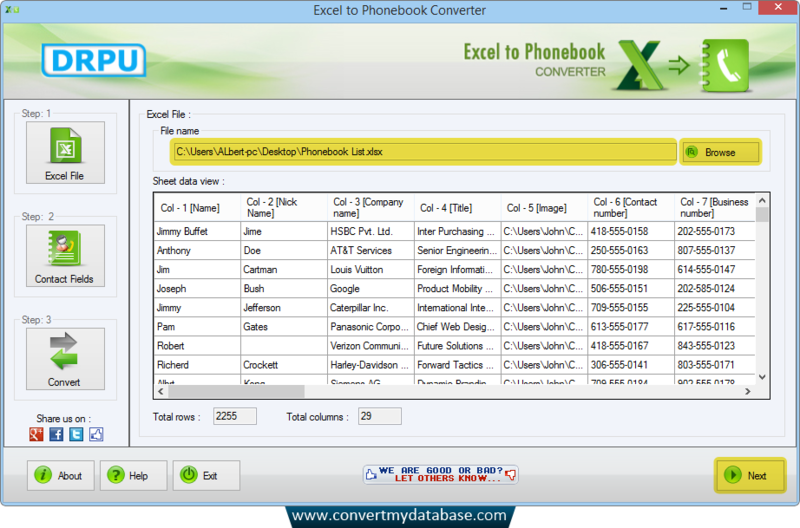 Excel to Phonebook Converter Software is designed to migrate bulk number of contacts from MS Excel spreadsheets into phonebook. Using Excel to Phonebook application, users can easily convert whole excel sheet containing Contact numbers, Email address and other important data into phonebook file format. Browse Excel File of contact details and click 'Next' button. Easily import converted VCF file on social media accounts like facebook, twitter etc. Convert contact details from MS Excel into Phonebook file format without installing MS Outlook. Import multiple contacts into phonebook from Excel sheet. Software provides option to delete empty rows and columns in excel sheet before converting into phonebook file.